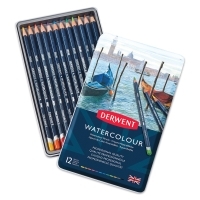 These professional-quality watersoluble pencils offer the freedom to switch from drawing to painting in an instant, with no change in tools. 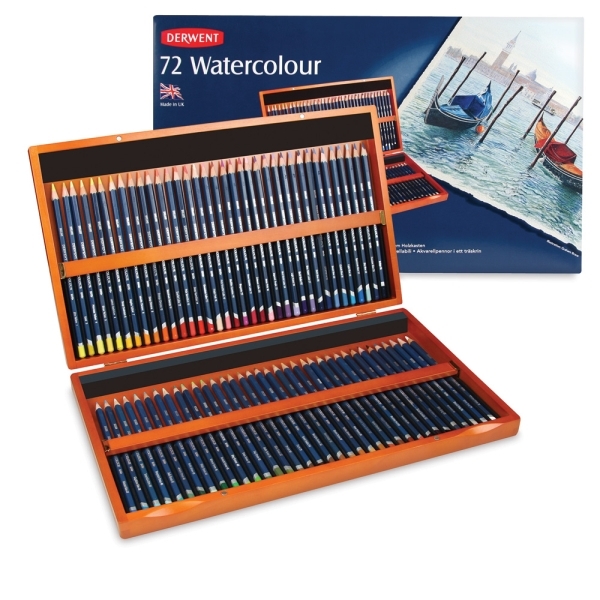 Use them to shade on dry paper, then quickly wash over with brush and water to get a blending effect. 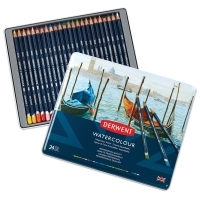 Derwent Watercolor Pencils can be used on wetted paper for intensified colors with softened edges, or wet the pencil first to create rich, textured lines. 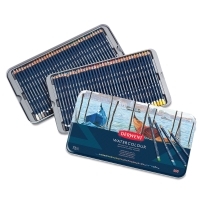 Each pencil is presharpened and has a 3.4 mm diameter color strip. 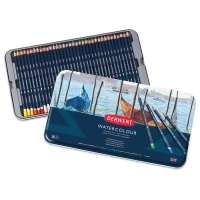 Watercolor Pencil Sets — Pencils are packaged in metal boxes with hinged lids. Hardwood Box Set of 72 — This set of 72 pencils comes in a hardwood case.